A certain amount of lift is generated by pressure conditions underneath the airfoil. Because of the manner in which air flows underneath the airfoil, a positive pressure results, particularly at higher angles of attack. However, there is another aspect to this airflow that must be considered. At a point close to the leading edge, the airflow is virtually stopped (stagnation point) and then gradually increases speed. At some point near the trailing edge, it again reaches a velocity equal to that on the upper surface. In conformance with Bernoulli’s principle, where the airflow was slowed beneath the airfoil, a positive upward pressure was created (i.e., as the fluid speed decreases, the pressure must increase). Since the pressure differential between the upper and lower surface of the airfoil increases, total lift increases. Both Bernoulli’s Principle and Newton’s Laws are in operation whenever lift is being generated by an airfoil. From experiments conducted on wind tunnel models and on full size airplanes, it has been determined that as air flows along the surface of a wing at different angles of attack (AOA), there are regions along the surface where the pressure is negative, or less than atmospheric, and regions where the pressure is positive, or greater than atmospheric. This negative pressure on the upper surface creates a relatively larger force on the wing than is caused by the positive pressure resulting from the air striking the lower wing surface. Figure 4-7 shows the pressure distribution along an airfoil at three different angles of attack. The average of the pressure variation for any given AOA is referred to as the center of pressure (CP). Aerodynamic force acts through this CP. At high angles of attack, the CP moves forward, while at low angles of attack the CP moves aft. In the design of wing structures, this CP travel is very important, since it affects the position of the air loads imposed on the wing structure in both low and high AOA conditions. An airplane’s aerodynamic balance and controllability are governed by changes in the CP. Figure 4-7. Pressure distribution on an airfoil and CP changes with AOA. Although specific examples can be cited in which each of the principles predict and contribute to the formation of lift, lift is a complex subject. The production of lift is much more complex than a simple differential pressure between upper and lower airfoil surfaces. In fact, many lifting airfoils do not have an upper surface longer than the bottom, as in the case of symmetrical airfoils. These are seen in high-speed aircraft having symmetrical wings, or on symmetrical rotor blades for many helicopters whose upper and lower surfaces are identical. In both examples, the only difference is the relationship of the airfoil with the oncoming airstream (angle). A paper airplane, which is simply a flat plate, has a bottom and top exactly the same shape and length. Yet, these airfoils do produce lift, and “flow turning” is partly (or fully) responsible for creating lift. As an airfoil moves through air, the airfoil is inclined against the airflow, producing a different flow caused by the airfoil’s relationship to the oncoming air. Think of a hand being placed outside the car window at a high speed. If the hand is inclined in one direction or another, the hand will move upward or downward. This is caused by deflection, which in turn causes the air to turn about the object within the air stream. As a result of this change, the velocity about the object changes in both magnitude and direction, in turn resulting in a measurable velocity force and direction. To this point, the discussion has centered on the flow across the upper and lower surfaces of an airfoil. While most of the lift is produced by these two dimensions, a third dimension, the tip of the airfoil also has an aerodynamic effect. The highpressure area on the bottom of an airfoil pushes around the tip to the low-pressure area on the top. [Figure 4-8] This action creates a rotating flow called a tip vortex. 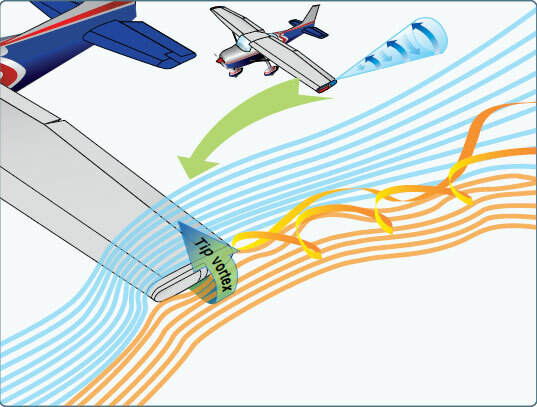 The vortex flows behind the airfoil creating a downwash that extends back to the trailing edge of the airfoil. This downwash results in an overall reduction in lift for the affected portion of the airfoil. Manufacturers have developed different methods to counteract this action. Winglets can be added to the tip of an airfoil to reduce this flow. The winglets act as a dam preventing the vortex from forming. Winglets can be on the top or bottom of the airfoil. Another method of countering the flow is to taper the airfoil tip, reducing the pressure differential and smoothing the airflow around the tip.